Ahead of the NBA’s All-Star Weekend, Jordan pays tribute to the place hosting this year’s annual event: North Carolina’s “Queen City” of Charlotte. The vintage-inspired iteration takes inspiration from the ‘90s with a retro aesthetic, while the reworked icon’s ‘Turbo Green’ hues nod to Charlotte’s famed NBA outfit, the Charlotte Hornets. Sporting a worn-in look, the pair is adorned with tumbled leather and shaggy suede overlays up top. The vivid teal hue which dresses the Swooshing and suede channels the classic Charlotte Hornet jersey, while shades of yellow and ultraviolet feature to the tongue for that added bit of colour. Finishing the uppers off, a new industrial kind of Jordan branding embellishes the sidewall, reading “SP 19 Air Jordan 1 High OG”. As with each previous Air Jordan 1 release, the standard details remain underfoot: an encapsulated Air midsole unit delivers supreme levels of cushioning, coupled with a rubber outsole for firm traction on and off the court. 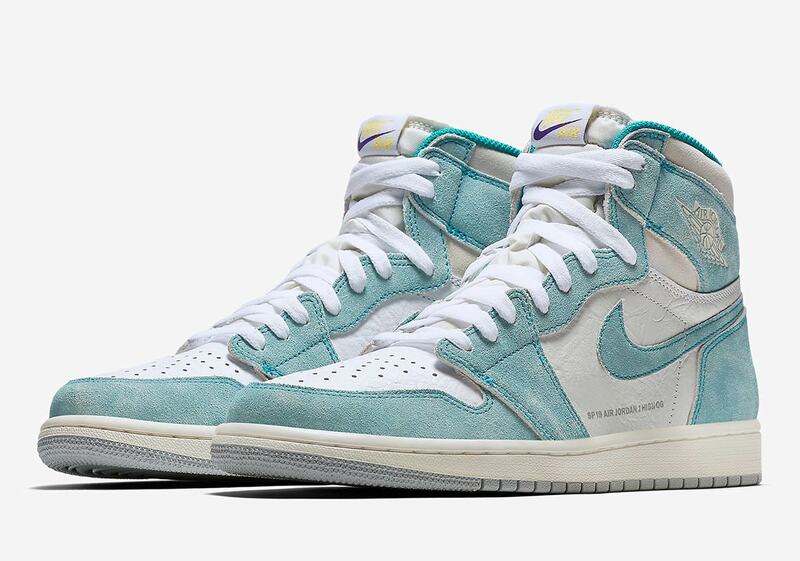 The Air Jordan 1 Retro High OG ‘Turbo Green’ will be available via the size? previews app and in selecte size? stores on Friday 15th February, priced at £130.